Am on a long ride, a ride across cities, small towns and villages meeting people, understanding cultures, exploring wildlife, gazing at gorgeous landscapes, riding through various terrains, relishing local cuisines, framing moments and understanding India from a traveller’s perspective. The road from Kochi until Tripunithura had a fair bit of traffic which eased as I rode into Kottayam district. 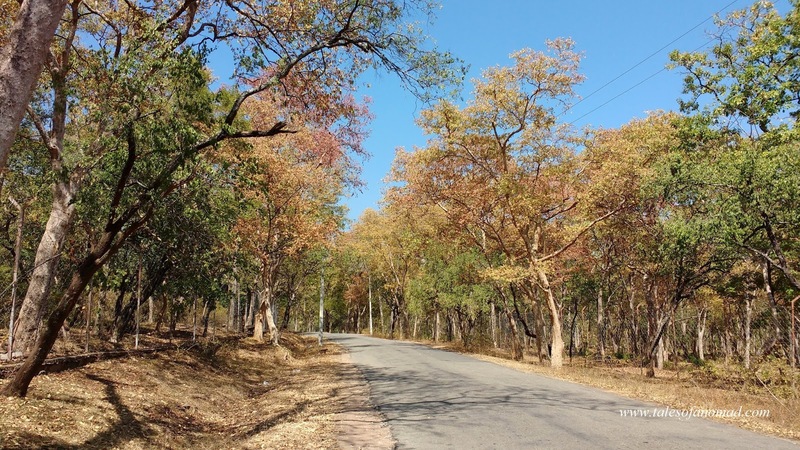 Though single tracks, the meandering roads with gradients are lined with rubber plantations, intermittent palatial bungalows of estate owners and pretty churches. The number of onlookers increased as I rode into smaller towns. With saddle bags, tank bag, backpack etc., could very well understand that curious expression on their faces. With an action camera fixed on the bike handle, capturing the ride, roads and landscape, the first-time experience was an interesting one. Though the weather was slightly warming up as I entered Idukki district, a cool breeze hit me on reaching Kuttikanam. The weather became mildly cold and the plantations changed from rubber to tea. The ride from Peermde to Kumily has a beautiful landscape with spread out tea plantations over undulated hills. Had booked my room at Able residency at Kumily through booking.com. Surprisingly, the concerned person was not in town and it was closed. However, he was responsible enough to book a room for me at Hotel Sithara. Seeing a Karnataka registration vehicle a few people conversed in broken Hindi and English. A smile spread over their face when they heard me respond in Malayalam each time. A quick Kerala lunch later, rushed to the information centre at Periyar Tiger Reserve to get tickets for the last boat ride for the day at 3.30 PM. Though the tickets are issued only an hour in advance, it was completely sold out. I was told to come early morning (5.30 AM) next day to get tickets for the first ride at 7.30 as tickets cannot be booked in advance. I hardly had any clue about the ‘drama’ that was to unfold next day morning at the reserve. Picked up entry ticket for the park (boating tickets are separate) and loitered around for a while gazing at the lovely lake, tall trees and the playful macaques. Missing out on the boat ride made me restless and I screened through the reserve’s other programs. Jungle scout, a jungle patrol with a guide and forest official at night seemed interesting. As the rush at the park ended with the sunset, we began the walk through the reserve at 7PM. Sighted sambars, gaurs, porcupines, wild boars, rabbits and night jars during the 2-hour trail. Headed to the room after dinner and slept off waiting for my alarm to ring at 5 AM. The day began with a rush to the Periyar Tiger rserve entry ticket counter at 5.30 AM. Was greeted by a small queue which had grown multi folds by the time the counter opened at 6AM. Clutching the ticket, rushed to the reserve entrance gate (1 km away), where there was a bevy of cars and autorickshaws lined up. At 6.20 AM, when the gates opened the vehicles rushed to the parking lot (2-3 Kms away). As soon as the vehicles reached the parking lot, visitors got out and started running. Absolute mad rush to the boating ticket counter. It was quite a run, more than 30 people running 200 meters to get hold of a ticket. On reaching there, we were told there are only 33 tickets available for the first boat ride at 7.30 AM (hopefully many had booked online many days ago, or else there are ‘ways and means’ to buy tickets). Of the 33, the first person took away 21 and a few more behind him got the rest. The gate closed and the remaining crowd waited in the same queue for the next boat ride scheduled for 9.30 AM. In this modern age where things are more organized, I just can’t understand this disgusting experience of standing in queues after queues to get hold of a ticket. As luck would have it, the 7.30 AM ride had a couple of seats available and the officials returned to check if they could squeeze one or two more. Right up in front of the queue and with just a single seat required, I was on my way to the anchored boat. As the boat went past the protruding stumps of the lake, my mind slowly distracted itself from the grueling experience that I had to go through early in the morning. The gorgeous landscape of the lake with thick forests in the background makes a beautiful frame. Spotted a family of elephants, a huge herd of bisons, playful otters, wild dogs feasting on a carcass and numerous birds such as kingfishers, cormorants, herons, storks etc. In the afternoon after lunch, went on green trail through the forest with a guide. 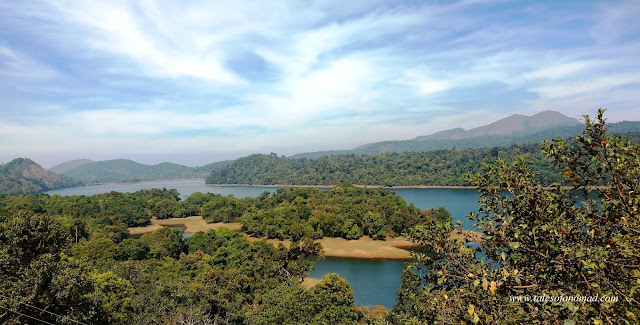 This trail gave a closer glimpse of the beautiful trees, numerous birds, a huge herd of sambars, mouse deer, hornbills, Malabar giant squirrels and a lone nilgiri langur. It was a long walk of almost three hours which took us through the expansive forest laced with dry leaves and percolating sunlight. The day ended with a tribal heritage performance by the Manan tribes who swayed to their folklore. After a quick breakfast at a small tea stall, left Kumily by 9 AM. It was nice roads all the way till Nedumkandam, where I took a break to meet my friend Dileep Abraham. It been more than twelve years since we met. He runs a popular tour operating company, Kerala Honeymoons. Planter’s café is where we met and the place was quite an impressive one. Left for Munnar in a while. The first tea estates popped up near Poopara and the closer I got to Munnar, more sprawling tea plantations spread out over undulating hills. It was a lovely ride through the winding roads with tea plantations on either side. Stopped by at a few vantage points, one offered panoramic views of Anairangal dam. Reached Munnar by 1.30 PM and checked into Noah’s Ark, a nice budget hotel which had many foreign backpackers staying. Spent rest of the day visiting the popular tea museum and then rode down the highway that leads to Kochi for a few kilometres. The route has a couple of nice view points and plantations. En-route the highway, took a detour on the road to Idukki. This road offered magnificent views of more plantations, silhouettes of distant hills and the setting sun. This is probably the best sunset point in Munnar. The sky turned pink and it turned cold as the sun went down for the day. Visited Eravikulam national park in the morning riding past numerous tea plantations. Known for the Nilgiri Tahrs and many other indigenous species, this is a popular park in Kerala which also makes it a crowded one. Further ahead the winding road led to Lakkom falls. Though not at its best due to lack of rains this time of the year, it did have sufficient water for the numerous visitors who gleefully took a shower under it. The tea estates changed to Sandalwood forests as I rode to Marayoor, 40 Kms from Munnar. It’s a protected forest and fenced all along. Marayoor is also known for its megalithic dolmens (burial sites) and jaggery. I stopped by at a small jaggery shed and it was interesting to understand its preparation. Rode back the lovely road to Munnar in the evening and roamed its busy streets which sell tea, spices and many souvenirs. The day began with a ride to Madupetty dam, a few kilometres away from Munnar. The expansive dam offers beautiful panoramic views with hills in the background. The low floating clouds made the already picturesque frame more beautiful. As it got crowded, headed further to Echo point, quite a touristy place with stalls lined up on either side of the road. The road runs along the periphery of Madupetty dam up to Echo point. Further down was Kundala dam, access to which was closed due to renovation. However, the dam can be seen along the road. Rode further through meandering roads past many tea estates to Top station, 2 Kms into Tamil Nadu. 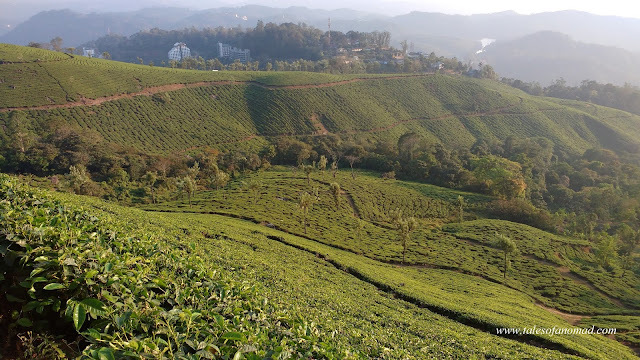 Tea estates gave way to tall hills and deep valleys as soon as I crossed over to Tamil Nadu. That was a refreshing change from the unending tea plantations. 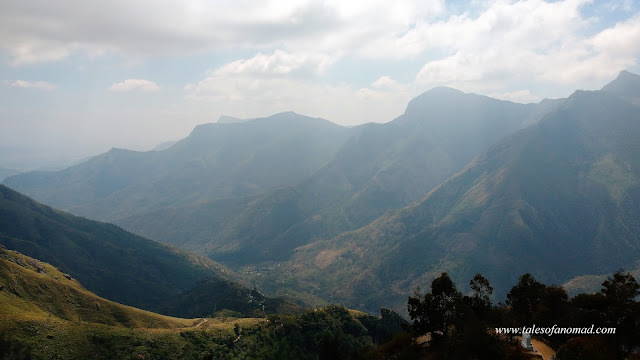 The watch tower here offers nice views of many hills such Kolukkumalai, Palani hills and a few villages way down in the valley. Gobbled a couple of bread- omelettes at a stall here and rode down to Koviloor and Vattavada. 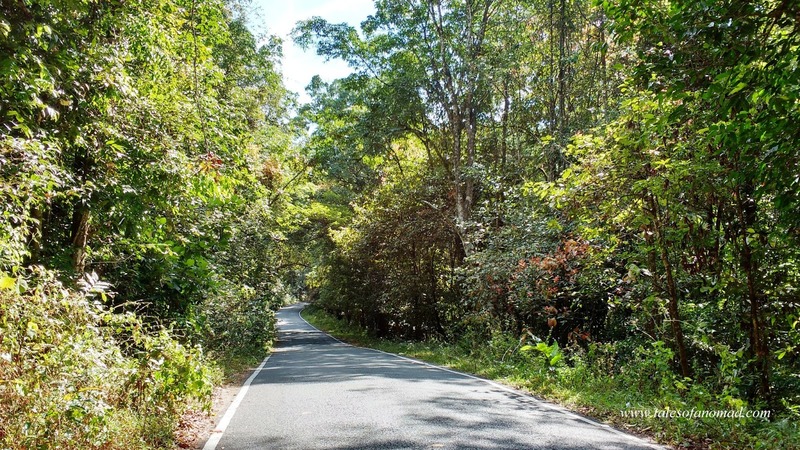 Entered Pambadum Shola forest reserve shortly and I had one of the best short rides here. Dense forest for the first couple of kilometres and then immensely tall eucalyptus trees for the next few. It was hardly 2 kms, but those tall trees created a surreal frame and that made my day. Koviloor and Vattavada are pretty villages known for their vegetable cultivation. Loved their charming landscape. Strolled around for a while and then rode back past the tall trees and winding roads to Munnar. It slightly drizzled as I loaded my saddle bags on the bike in the morning. Hoped it would be a passing shower, but turned out to be a continuous one as I set out from Munnar to Valparai. The light drizzle turned heavier and mist hovered all across reducing the visibility to less than 50 meters. Stopped on the way to cover up the luggage as the drizzle continued. It did reduce a bit near Marayoor, but again picked up as I rode through Chinnar wildlife sanctuary and Anaimalai tiger reserve. Despite the rains, the ride was a wonderful one. Both the forest reserves looked beautiful with drenched trees and a gorgeous landscape. As I stopped near Kurichikottai for a cup of tea, locals were quite amused to see me ride with so much of gear and luggage. As always, the questions poured in as I sipped some hot tea. Rode through the drizzle past small villages of Tamil Nadu to get on to the highway from Pollachi to Valparai. Another entry gate for Anaimalai reserve and I was soon on the ghat section. Aliyar dam showed up just before the inclination. Struggled to take photos because of the rain and rode up the 40 hair pin bends with a couple of quick stops to capture the vistas from the top. The road wound its way past Monkey falls, Tiger Valley and Loam’s view point. Though it was hazy and drizzling, the views looked majestic as I went higher. Thick shola forests lined with tall trees marred the views after a while. After the 31st hair pin bend, tea estates popped up and the bends went down for a while. Usually, it’s either uphill or downhill all the way. It reminded me of Munnar as large tea gardens showed up everywhere. 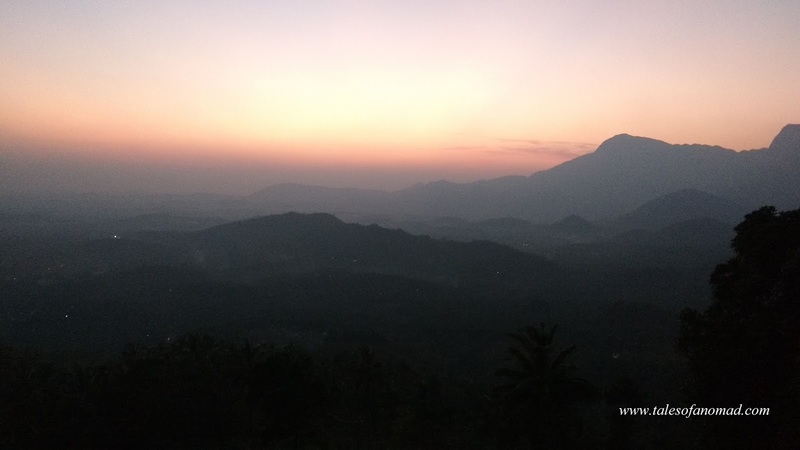 As I entered Valparai in the evening, the sky was clear with absolutely no rain. I was probably the only soul in Valparai riding around drenched to the last thread on the body. Checked into Hotel Holiday Break, a decent one and the good part was that my room overlooked a tea estate. As I got out and strolled through Valparai tow, it drizzled for a couple of seconds. Sun played hide and seek for a while as the two second drizzle continued intermittently. Valaparai is an ideal destination for bird lovers. Spotted many species such as storks and egrets as I rode through the tea estates. 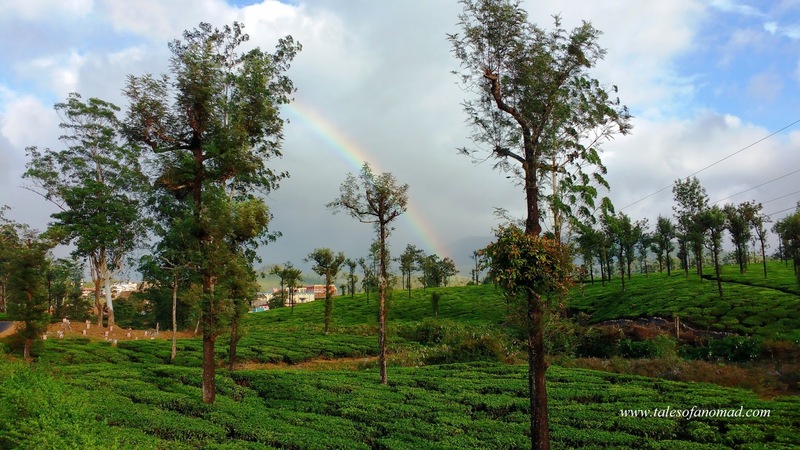 Valparai has only one major road, which also happens to have all the shops, restaurants and hotels. The day was spent riding through the unending plantations of Valparai. 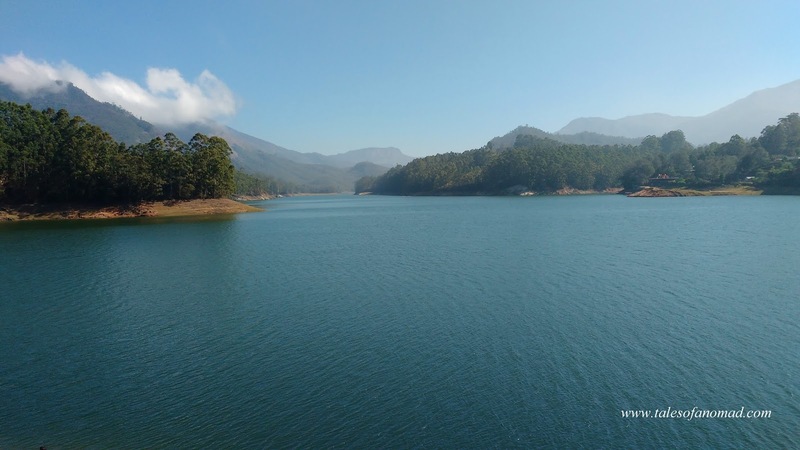 Strolled through the plantations to the vantage point of Nallamudi Poonjolai and then rode past more tea gardens to Sholayar dam. 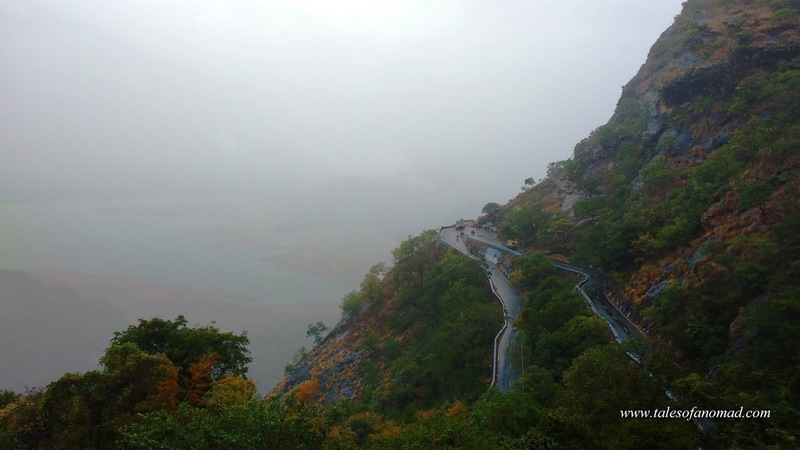 As I couldn’t enjoy the ghat ride the previous day due to rains, went down the hair pin bends again to Loam’s view point and Monkey falls. The ride through the meandering roads was a blissful experience. Enroute, also spotted a few lion tailed macaques. 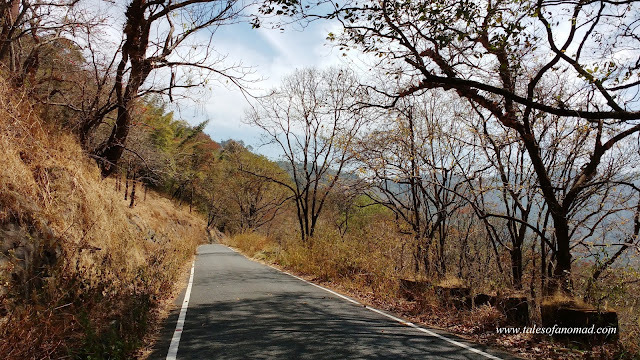 The ride to Nirar dam and Chinnakallar was futile as they were closed to visitors, but enjoyed the ride to those attractions. 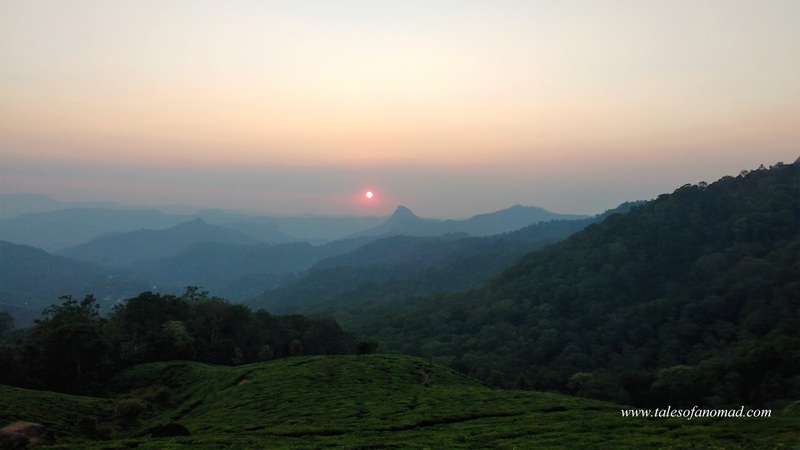 Read the full post on Valparai here. Left Valparai by 9.30 AM and rode past the tea plantations to enter Malakkapara forest area in Kerala. The policeman was quite curious to know about my ride and action camera. He enquired about its clarity, price and a lot more. As per regulations, I was asked to exit the gate at Vazhachal (55 Kms) within two hours. Two hours was quite sufficient to cover 55 Kms was what I felt as I entered the gate. However, the forest was quite a captivating one and I took all the time to soak in its thick foliage. 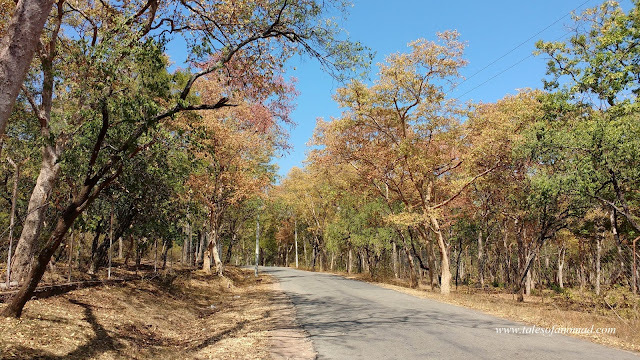 The road was almost devoid of vehicles, sunlight percolated through the tall trees, there were elephant dung all over and all that I could hear was the rumble of my bike and the silence of the dense forest. Lower Sholayar dam popped up intermittently and was visible through the thicket. However, it took a while for the forests to clear and the expansive reservoir to spread out. This was a massive reservoir in comparison to Upper Sholayar near Valparai. The road became narrower after the vantage point as I rode down a few hair pin bends. The bare trees with golden brown leaves had a nice charm to it. The forests showed up again shortly as I crossed a few rivulets. I realised that I was running short of the given time and had to speed through the last stretch of the beautiful forests of Vazhachal. Had a glimpse of Vazhachal waterfalls as I crossed the exit gate of the forest, but hurried up to the more popular Athirapilly falls, a few kilometres away. Though the summers were about to set in, Athirappilly falls looked majestic with its gushing white waters. Had a very short stop over near the view point on the road and then headed to Thrissur. Enroute, had lunch at a highway restaurant where two boys came up and asked where am headed, as they had spotted me in Valparai too. I said Wayanad, and they responded with a smile, “Keep travelling”. After Thrissur, the roads turned single track as I rode through the towns of Shornur and Pattambi. Had a short rest near Perinthalmanna before riding ahead. While refuelling at a pump in Pulamanthol, the young chap thought I was kidding when I told him it was a camera that I had mounted on the handle bar. Had to switch on and play it for him to believe. It was a breezy ride through the small towns of Thirurkad, Manjeri, Areacode and Mukkom to Thamarasseri, where the ghats to Wayanad begins. The sun had almost set when I reached the ghats, but the mauve skyline looked beautiful and I stopped for a break. More curious onlookers and the familiar questions flowed as I answered with a smile. One asked whether the solo ride made me feel lonely. Am used to it and I love the advantage of deciding the itinerary was my response. He gave a half nod in response and wished luck as he left. Thamarassery ghats have well laid wide roads and it was a pretty quick ride through the darkness to Kalpetta and further ahead to Kaakavayal. Tribal Hut was where I had booked my room. Checked in and was surprised to see that they had common baths and small rooms (kind of a dormitory), very different from what they had portrayed on booking.com site. Though the huts that they have looked nice, they did not seem very safe. Opted for the small room and crashed for the night. Night Jungle patrol should be interesting. Have a good ride. :-D our experience at the ticket counter of Periyar was interesting too .... though in the end we did manage to get the boat ride tickets. That's nice that you could make it. I had a better experience maybe was just better informed earlier day... First boat I got. So cool -- what you are doing, Nomad. All the very best. Have fun - loads of it and ride safe!! Yeah, that's an all time classic for all Bangalore malayalees. :) Thank you so much, Nambiare.